Hailing from Nashville, by way of Boston, Della Mae imbues their music with an undeniable fierceness. The power is palpable in their stage shows while deftly transcending on the recent The Butcher Shoppe EP . Formed in 2009, Della Mae were originally considered one of the few all-women string bands on the bluegrass scene. That designation required Della Mae to approach their music with moxie and resolution. Indeed, their career is evidence they have always done so and The Butcher Shoppe EP exceeds these expectations. Composed of unreleased fan favorites from their live sets as well as cover songs, the EP is an unadulterated display of their musical alacrity. As the first seconds of The Butcher Shoppe EP transpire, it is apparent that Della Mae's musicality is brazen. The thrilling opener, "Bourbon Hound", gives the listener a sense of their stage shows' energy and affinity for fun. A drinking-song spiked with double entendre, "Bourbon Hound" echoes the grittiness of Wanda Jackson's rockabilly. Much as Jackson intermixed toughness with sexuality, Della Mae shows a similar penchant when they sing, "Why don't you swing it on back / Make another Old Fashioned / Stir it up right for all that dancing / Baby, won't you whirl me around." It's important to acknowledge the track is called "Bourbon Hound" not booze-hound. Instead of producing the track as a full-fledged party anthem, Della Mae uses the lyrics to demonstrate their knowledge about whiskey and its flavor profiles thereby conflating tippling with expertise. More so, "Bourbon Hound" exhibits a frolicsome wordsmithery with the lyrics "Booker takes you home for the night / A little Buffalo Trace and my feet are off the ground". Della Mae's ability to interject carousing with lexicon is both celebratory and clever. Besides the convivial wordsmithery, Della Mae's musicians are a master class. The clearest display of Della Mae's adroit musicality is in the instrumental "No-See-Um Stomp". The track is a three-minute blast showcasing Della Mae's intrepid musical talents. Opening with Kimber Ludiker's virtuosic fiddle playing, she eventually meets up with twin guitar contributions from guest musicians Avril Smith and Molly Tuttle. Zoe Guigueno's bass, underscored by Jenni Lyn Gardner's mandolin, tricks the ear into hearing the word "stomp" despite the lack of vocals. Finalizing the track as an instrumental is a shrewd production choice. Adding a layer of lyrics would certainly clutter "No-See-Um Stomp" then render the impressive string plucking secondary. Pristine and nimble, "No-See-Um Stomp" is why Della Mae is such an enthralling group. 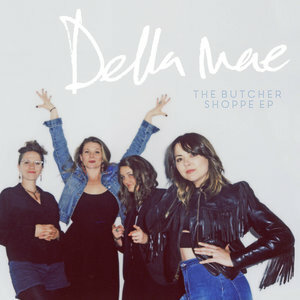 Essentially, The Butcher Shoppe EP is a musical memo to not mess with Della Mae. In case there were any doubts, "Sixteen Tons" solidifies their strength and power. Their cover of the Merle Travis classic, made famous by "Tennessee" Ernie Ford, combines elements of soul with Ludiker's plaintive fiddle and Alison Brown's Arcadian banjo. But Celia Woodsmith's vocals are the showstopper. At times her voice jumps from abrasiveness to sultriness imparting a quasi-theatrical spin on the coal miner's sorrow. Della Mae, however, casts aside melodrama for fortitude when the lament reaches its apogee: "If you see me comin', you'd better step aside / A lotta men didn't, and a lotta men died / I got one fist of iron and the next fist of steel." Della Mae's authority is apparent. The Butcher Shoppe EP ends with a cover of the the Allman Brothers' "Whipping Post". Again, Woodsmith is valorous and seductive endowing the musical epic with acute misery. Later in the EP, Della Mae also pays tribute to Flatt and Scruggs with their cover of "Sleep With One Eye Open". But the covers are problematic as they only emphasize male musicians. Without question, Merle Travis, "Tennessee" Ernie Ford, the Allman Brothers, and Flatt and Scruggs are foundational to the history of bluegrass and folk music. But where are the equally inspirational and important women musicians? As Della Mae misses the opportunity to cover prominent female forebearers, they also miss the opportunity to usurp androcentrism. Despite this, The Butcher Shoppe EP succeeds in partially shoving the boy's club out of the way while making room for Della Mae's dynamism. In doing so, Della Mae's regain their position as bluegrass bad-asses.